Blue Falls of Costa Rica - Nature as perfect as it can get. 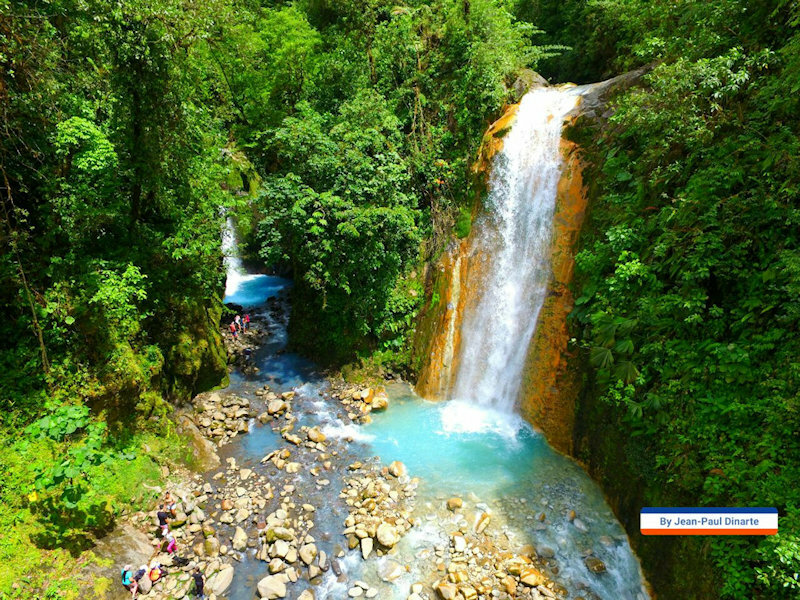 Ready for your bluest and coldest waterfall experience in Costa Rica? We are happy to introduce our newest project: Blue Falls of Costa Rica – Nature as perfect as it can get and truly the mother of all blue rivers in Costa Rica. Situated close to Catarata Del Toro in Bajos Del Toro Amarillo, Sarchí we will offer you something mind blowing. A truly blue river with 7 blue waterfalls, 3 normal waterfalls, rapids, swimming pools, views, nature and hiking in one. Since 2017 we are offering these amazing tours. As for now we will go with the flow and will operate under the ‘Catarata Del Toro’ flag. Starting point for all tours will be Catarata Del Toro, Costa Rica’s Ultimate Secret®. In the meantime, we keep working and improving. Our ultimate goal is to develop in approximately 3 years a project that stands. And with the most beautiful parts already given to us, like the rivers, trees and the layout. We want to improve the project in full harmony with nature or at least as much as possible. First of all, a bridge, a paved trail, fences, safe access to the waterfalls and a safe river crossing. Secondly a reforestation with 1.000+ native (fruit) trees and 20+ sitting areas. And thirdly an official entrance, office, green parking area, bathrooms, showers, picnic area, hanging bridges and a coffee corner. The aforementioned reforestation is to attract birds and wildlife and we are aiming for the Quetzal. Therefore, in the end, you can probably spend an entire day here. All the above: Deo Volente. Please scroll down for a video, availability and more information. 1 – We will descend into the blue river, cross it, and walk towards the Las Gemelas. 2 – Same way back where we can take a quick look from above at the blue rapids. 3 – Entering the blue river again at a lower point into a nice blue pool. 4 – Time to cool down and let’s swim blue and as long as you wish. 5 – From here we are heading back. What to expect: beauty, 2 blue waterfalls, rapids, virgin forest and a beautiful river section. Also, a blue swimming pool, mountains, birds, views, nice hike, nice workout, good feeling and happy to be back. Let’s beat your expectations! If you purchased the combo then the next tour will be Catarata Del Toro, Costa Rica’s Ultimate Secret®. You need to bring: walking shoes or boots, anti-slip tennis- or water shoes for the swimming part. And, or just old tennis shoes for the entire trip, swimming gear, anti-mosquito repellent, sun blocker, 1.5 liters of drinker water, snacks and a camera. We supply: safe and guarded parking lot, restroom before and after, walking stick, tour guide and a most wonderful experience. Opening Hours: Monday to Saturday 07.00 – 16.00 hours and Sunday closed. In rainy season the best time will be early mornings and the final openings hours depends on the weather. Minimum clients needed 2 and maximum 20-25 per group. If you want to do on the same day, also Catarata Del Toro, Costa Rica’s Ultimate Secret® then the combo price will be only USD 25 = value for money! Important to know and accept: Accept limitation of liability, no yoga, no pets and no kids under the age of 10. Also, we offer no transportation to and from our start location: Google Maps – Waze: ‘Catarata Del Toro’. The customer is responsible to be on time and for bringing the correct clothes/shoes/gear. There is a possibility to buy breakfast, lunch or a snack. Good to Know: The tour is as safe as possible. In the event of an earthquake or another natural disaster, it is easy to get to higher grounds and safety. And also, we offer the most accessible access. We have a liability insurance from the INS, guaranteed by the state of Costa Rica. We do take care of nature, we do pay and treat our employees fair and square. 1 – We start hiking up a little hill and then straight down to the beautiful waterfall ‘Tepezcuintle’. 2 – Same way back and then we will descend into the blue river and towards the Las Gemelas. 3 – Same way back where we can take a quick look from above at the blue rapids. 4 – Entering the blue river, for the third time, again at a lower point into a nice blue pool. 5 – Time to cool down and let’s swim blue and as long as you wish. 6 – From here we will take a not so easy route and we will bring you to waterfall # 4, 5, 6 and 7. 7 – Down to the blue lake. 8 – And finally, a section where we can spot another 3 waterfalls and some nice surroundings. 9 – From here we are heading back. Know that we will go as fast and far as you want and that anywhere at any time you can have your (private) spot for a swim and or a break. What to expect: Beauty, 7 blue waterfalls, rapids, virgin forest and river sections, blue swimming pools and a blue lake. Also, mountains, birds, normal waterfalls, forest, canyons and happy to be back. Let’s beat your expectations! Duration: 5 – 6 hours. Total Walking Distance: 6 km. Price: USD 50 – This includes: Blue Falls – Full and Catarata Del Toro (value USD 14)* – value for your money. Reservation: Needed – WhatsApp +506 8399-7476 or by e-mail. Opening Hours: Monday to Friday 07.00-09.00 hours, Saturday 07.00 and Sunday closed. As rainy season is here we will do this tour once a day at 07.00 – 9.00 hours. Minimum clients needed 2 and maximum 15 per group. You can go down to Catarata Del Toro before or after the Blue Falls – Full tour. Important to know and accept: accept limitation of liability, no yoga, no pets, no kids, age: 18 – 60 years and you need to be in extremely good physical shape. Also, we offer no transportation to and from our start location: Google Maps – Waze: ‘Catarata Del Toro’. The customer is responsible to be on time and for bringing the correct clothes/shoes/gear. There is a possibility to buy breakfast, lunch or a snack. Availability for the Blue Falls – Full tour is most of the time the same as for the Blue Falls – Light tour, but please contact us first.